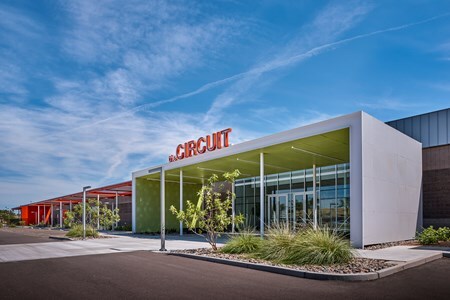 Built in 1982 as a semiconductor building, The Circuit is an ultra-modern, 185,000 square foot adaptive re-use office project located at the major intersection of Loop 101 and Loop 202 in Tempe. The building is designed for large office users looking to attract active professionals to a creative environment. The Circuit’s dynamic design elements allow for efficiency, density, and collaboration, all of which are in-demand attributes of today’s office users. Building features include a collaborative indoor-outdoor layout enhanced with 17-foot ceilings, 14-foot floor-to-ceiling windows and more than 60 skylights to maximize natural light. Additionally, The Circuit boasts a 7:1,000 parking ratio, which is about 40 percent higher than most office buildings in the market. The property was acquired in July, 2014.